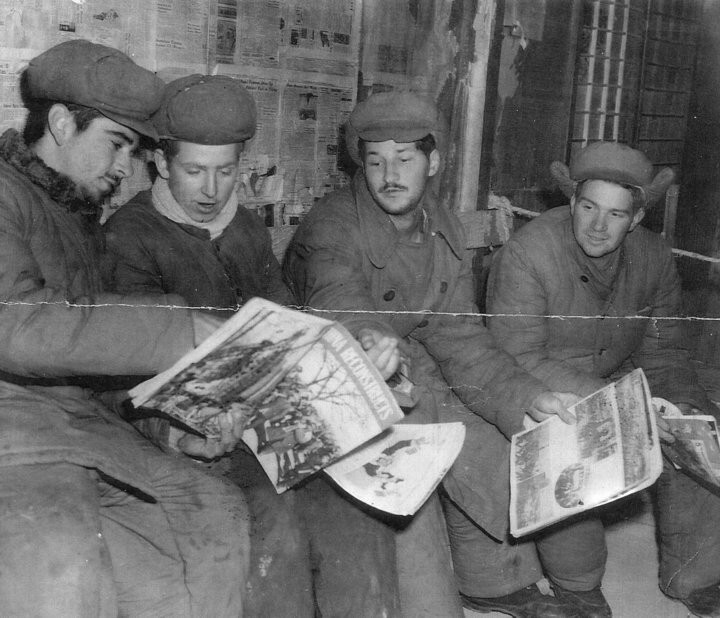 Four GI's who are prisoners of war of Reds relax at camp where they are being held captive in Korea. Left to right are: Pvt. Jenius J. Sedotal, Napoleonville, LA; PFC William E. wood, Washington Courthouse, Ohio; Pvt. William D. Freeman, Jr., 1935 Pecan Ave., Atlanta, GA; and PFC Richard Petersen, Ishpeming, Michigan. This is one of a series of photos taken by AP staff photographer Frank Noel, himself a captive of Reds, and passed by UN and Communist censors.